Bob Johnson's Rants and Raves: Winning! Below I’ve listed the email I always send out to our winners. You’re friends and family have won, and now you’re the winner of this week’s drawing! It’s a really nice Life Fitness Body Shape Kit (Accessory Kit - $299 Value). Give me a call or email me and let me know when you can come over and pick up your prize, and get a couple pictures taken. Great job on the daily exercise, it’s a lifestyle! Thank you for taking part in the Leisure Fitness – Be Fit, Stay Fit Challenge! of the BE FIT, STAY FIT CHALLENGE – Holiday Giveaway! 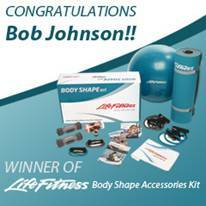 You’re the winner of the Life Fitness Body Shape Kit, you have 30 days from today to claim your prize. You can claim your prize by responding to this email, or by giving me a call at 302-224-5024, please leave a voicemail with your contact information if I miss your call! Please let us know if you’d like to have this product shipped curbside, or if you would like to pick it up from one of our 20 retail stores! be fit. stay fit. live well.